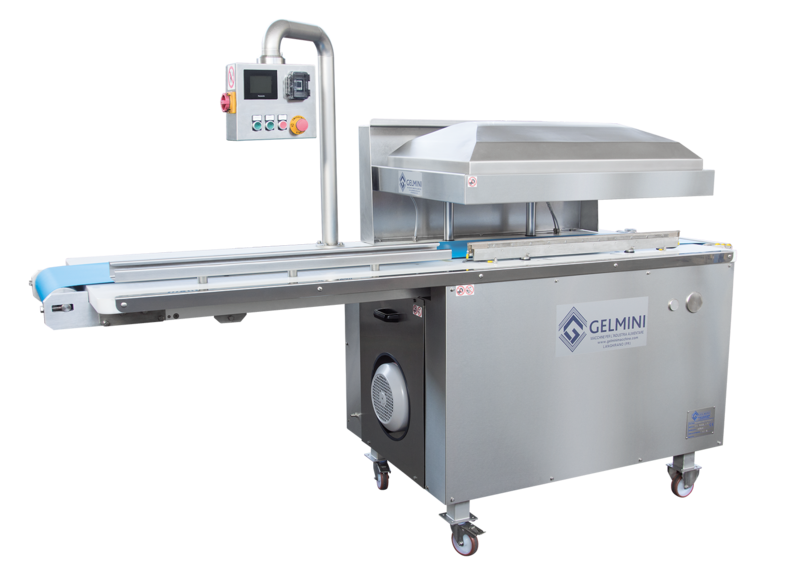 The vacuum packaging machines from Gelmini are designed for packaging the typical products of the Italian Food Valley, such as prosciutto di Parma and Parmigiano Reggiano, and are perfect even the case of major sizes. The company’s location in the heart of the Italian Food Valley, the deep knowledge of the food sector and the high professional team, have allowed Gelmini Machines to grow steadily, from its beginnings in the 80s, with progressive technological and productive development. To identify and solve problems, develop new solutions, search for maximum productivity for the customer, anticipate the needs of the market: these are the challenges the Company deals with every day, supported by its internal technical department (design, development of prototypes, engineering and manufacturing as well as customer assistance) and by an external team of engineers specialising in issues concerning compliance with regulatory requirements on hygiene, safety and respect for the environment. Machines and systems are designed to allow ease of use and minimum maintenance, to maximize clients’ autonomy and efficiency. Delivery, installation, final testing and after-sales support service are guaranteed by internal staff. Despite the company’s growth over the year, Gelmini Macchine has chosen to keep these services on a small enterprise scale with the aim of preserving a direct trust-based relationship with customers. The team of specialized technicians takes care of the installation and final testing at the client’s premises, as well as of the training of client’s personnel. Gelmini also follows customers even after installation and start-up of the plants ensuring scheduled maintenance interventions, technical assistance, supply of spare parts and accessories, upgrades and improvements of the machines. Currently, Gelmini Machines devotes special efforts to cheese processing machines, an area where the company is market leader, serving 99% of Italian companies that operate in the field of hard cheese like Parmesan Gelmini. Another growing sector is that of machines for processing semi-hard and soft cheese, such as Emmentaler, with which Gelmini Macchine aims to gradually penetrate markets in Eastern Europe, North Africa, Morocco, Brazil, USA and Canada. The proposed solutions guarantee high industrial productivity, reduced labour, minimum maintenance and final quality of processed products. Quality cheese and salami Stainless steel bell, fast cycle speed, Italian pump: these are just some of the main characteristics of Gelmini’s vacuum packaging machines, which allow to adjust the vacuum (from 96% to 99.9%) according to the product to be packaged, ensuring a minimum residual of less than 0.5%. Thanks to the double sealing bar, these machines can use both polypropylene bags and large aluminium bags. Available in various models (with tilting hood or with belt) and a variety of additional equipment (inert gas, production waste recovery, ejector), they are characterized by their sturdiness, ease-of-use and simple maintenance. Characterized by a solid structure, model CG-1000N provides a perfect vacuum. 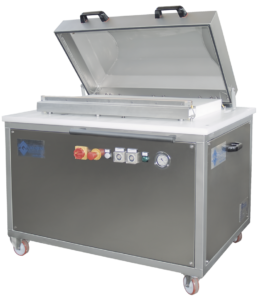 Available in various models with different optionals, it is especially suitable for food products such as ham, bacon, cheese, fish and sausages. The machine can be integrated into manual packaging lines. The belt vacuum packaging machine CG 1000NT is suitable to be included in a production line to automate production. Fast cycle speed, simple use and maintenance, perfect vacuum conditions on a solid structure are the main characteristics of these machines. The are suitable for handling heat-shrink material, with aluminium bellows.